The most common reasons for couples to conduct a vow renewal is to mark a milestone anniversary: ten year, twenty year, fifty year, etc. Whatever the number of the anniversary, though, you can always conduct a vow renewal. Have the wedding you did not have the first time around – If you decided to have a simple wedding or just go to the courthouse, you may decide to have a grander event to mark your marriage to one another. This give you the chance to have the wedding you may have wanted but did not get the first time. Sometimes, couples will decide to have a vow renewal ceremony when they are starting fresh; after some rocky times, a couple may feel the need to recommit themselves to each other and go forward from there. 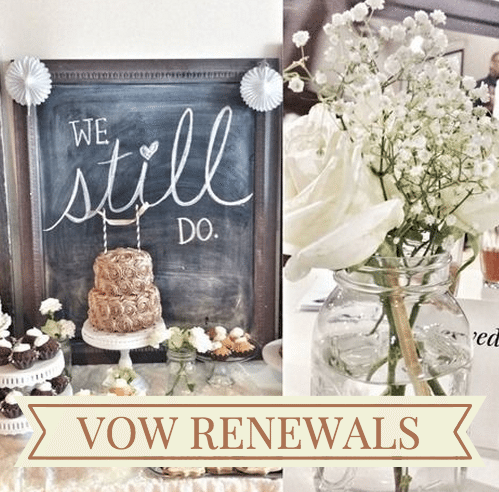 Not only are vow renewals a mark of time or a fresh start, they can also simply be a public announcement that you are still going strong and will continue to be there for one another through thick and thin. A public declaration is a great way to prove that you are still committed and are ready for whatever may come next. After so many years being together, you will find that you lose some of the romance or what you felt for each other on your honeymoon. Vow renewals are a great way to get back that honeymoon phase for a time and get the romance back into your relationship. The renewal of marriage vows can make a grand difference in the way your marriage moves forward. Not only does your spouse get to see that you are committed, you can also recognize for yourself just how committed you are and how committed your spouse is to you.